After World War 1, the British Museum and the Penn Museum decided to excavate in Iraq. Since Iraq was under the British mandate, the sites were easily accessible; the only issue was to find the best place to dig. The approval had to come from Britain’s colonial office headed by one Winston Churchill and Assistant Secretary and Advisor on Arab Affairs, T.E.Lawrence. For the excavation, they picked Charles Leonard Woolley as the director; Lawrence had worked with Woolley during an excavation in Carchemish, Syria before he ran through Arabia like an Energizer bunny who had drowned a few Red Bulls. One of Woolley’s assistants during the third season of excavations was Max Mallowan, who met his future wife in Mesopotamia – Agatha Christie. The expedition started work in 1922 and one of their major discoveries was the Royal Cemetery of Ur which belonged to the First Dynasty. Sir Leonard Woolley excavated more than a thousand graves dating between 2600 – 2400 B.C.E out of which seventeen were royal tombs and in one he found a forty year old, five foot tall woman who was given an elaborate burial. We know this woman as Queen Puabi from one of the three cylinder seals found on her body. She was accompanied in her death by handmaidens and warriors, who were put to death, not by poisoning, but by driving a pike into their heads. An interesting item from Queen Puabi’s tomb was a cloak of beads, made from carnelian beads (pic), which comes from the Indus region. Thus a queen who lived in Southern Iraq, 4500 years back, was able to obtain beads from the Indus Valley region through the trading hubs of the ancient world. Who bought these beads to Ur? What do we know about these traders? Were they Harappans or middle men from Bahrain/Qatar/Iran? Can these traders help us in deciphering the Indus script? To put the Indus influence in Mesopotamia in context, we first need to understand the difference between Sumer, Akkad, Ur, Puabi, Sargon, Gudea, and Guabba. A good starting point is 2900 B.C.E when there were many city-states ruled by individual kings who were wealthy enough to import luxury goods and powerful enough to give offers to their employees which they could not refuse (remember the pike). Then at some point, the region became divided into Sumer and Akkad, which were not political entities, but collections of city-states speaking two different languages. Out of these two, Sumerian is unrelated to any other language while Akkadian is the ancestor of languages like Assyrian and is related to Hebrew and Arabic. The Akkadians and Sumerians remained in close contact, borrowing words from each other. The Akkadians also adopted the Sumerian script: Sometimes with short inscriptions it is hard to tell if the language is Akkadian or Sumerian. In 2270 B.C.E Sargon combined the region to create the Akkadian Empire. Sargon’s birth story is an interesting one, especially to Indians. His mother, a priestess, conceived him in secret with an unknown father. She then set him adrift in a basket sealed with bitumen in the Euphrates. The river then took him to Akki the gardener who bought him up as his own son. Sounds familiar? 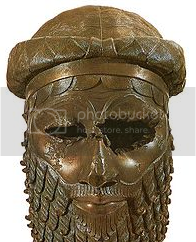 We don’t know how Sargon looked like, but we have a life size copper head of what is most likely his grand son, created using the Lost-Wax method. But it is in Sargon’s time that we hear about Meluhhans, identified as people from the Indus region, for the first time. He boasted about ships from Dilmun, Magan and Meluhha docking in the quay of Akkad. There is also a tablet dating to 2200 B.C.E which mentions an Akkadian who was the holder of Meluhhan ships: large boats that were transporting precious metals and gem stones. This link between Lu-Sunzida and the earliest layers of Rg Veda was noted by Asko Parpola, who suggested that the name could have been a direct translation from Indus to Sumerian. Does this mean that the Vedic people were contemporaries of the Akkadians violating the lakshmana rekha of 1500 B.C.E? Not so fast. Listen to the explanation for this which is similar to the one which works around the problem of the discovery of real horse bones in Surkotada. According to this explanation, two Indo-Aryan groups — the Dasas and Panis — arrived around 2100 B.C.E from the steppes via Central Asia bringing horses with them. If the Indo-Aryans arrived earlier does this mean that the date of Rg Veda can be pushed to an earlier date than 1200 B.C.E? The theory says, the folks who came in 2100 B.C.E were not the composers of the Veda; they came in a second wave, a couple of centuries later. So according to Parpola, the name Lu-Sunzida could refer to the culture of those early arrivals — the Dasas, Vratyas, Mlecchas — who occupied the Indus region before the composers of Vedas. Thus Meluhha could be an adaptation of the Sanskrit word Mleccha. Following the decline of the Akkadian dynasty founded by Sargon, city states like Lagash in the south gained independence and in 2144 B.C.E, Gudea became the town-king or governor. Direct sea trade, which had been active during Sargon’s time, 150 years back, between Meluhha and Mesopotamia was happening at this time too: Meluhhans came from their country to supply wood and raw materials for the construction of the main temple of Gudea’s capital as well as red stones and luxury goods. Following the Akkadian period (2300 – 2150 B.C.E), there was a Sumerian renaissance resulting in the Third Dynasty of Ur, usually mentioned as Ur III Empire. It was during the Ur III period that one of the most famous landmarks in Iraq — the Ziggurat of Ur — was built. The Sumerian King Ur-Nammu who built the ziggurat, which stood in the temple complex of the moon god Nanna, appointed his daughter as the high priestess. This was a practice started by Sargon and it continued till the 6th century B.C.E. Various city states like Gudea’s Lagash ended with the emergence of Ur III state, but these political changes did not affect trade, which continued as usual with one difference.The direct trade by Meluhhans on Meluhhan ships reduced — there is a decline in Indus artifacts in Mesopotamia —- instead goods were bought by the middlemen in Dilmun. One reason is that by the time of Ur III the de-urbanization of Harappa was happening. While trade from Harappa declined, trade from ports in Gujarat boomed via the middlemen bringing in various kinds of Meluhhan wood, some of which were used to make special thrones with ivory inlays. In Part 2, we will look at what these Meluhhans did following the decline of direct trade. This post is based mostly on two papers,  Simo Parpola, Asko Parpola, and Robert H. Brunswig, “The Meluḫḫa Village: Evidence of Acculturation of Harappan Traders in Late Third Millennium Mesopotamia?,” Journal of the Economic and Social History of the Orient 20, no. 2 (May 1977): 129-165 and  P.S Vermaak, “Guabba, the Meluhhan village in Mesopotamia,” Journal for Semitics 17, no. 2 (2008): 553 – 570. Of course, Sargon’s birth story also sounds very familiar to those who have read the biblical account of Moses’ birth and how he ended up being adopted into the Egyptian Royal Family. ‘tama aaseet tamasaa guuLhamagre praketam salilam sarvamaa idam’, which roughly translates to: ‘darkness was there concealed within darkness, everything was full of salilam’. In this case clearly, the salilam cannot mean water here since we are talking about the situation before any creation. All this seems like a lot of hair-splitting and probably doesnt affect what you are saying, but I felt like contributing my 2 paise. Kedar, Actually thanks for the hair splitting. It does not affect this narrative much, for the point here is that there was a cultural importance for the buffalo, which the Mesopotamians did not have. The evidence in Rig Veda is against so called Aryan Migration from Central Asia. Absence of Horse in Indus valley doesn’t mean that horses didn’t exist in India elsewhere before 1500 B.C. None of the vedic gods Indra, Varuna, Mitra, Asvins, Maruts, Dawn , Visvadevas, Visnu are worshipped in Central Asia . If some people of Central Asia carried this Rig Vedic tradition to India, what about the rest of the people who lived back in Central Asia. They should be worshipping these Vedic gods too. Indologists are misleading people by incorrectly analyzing and giving interpretations to Rig Veda. Truth must be given a chance to flourish instead of their opinions. Their opinions will be shattered in due course of time when further excavations are carried in Indus valley and when Indus script is fully discovered. Is Ziggurat etymologically related to Jagannath? We know that Juggernaut is. Sanskrit has many specialties, one of them being paranamosias. Hymns have multiple interpretations, depending on how we divide them. I am curious to know if the water-buffalo hymn is a metaphor for the chakras or padmas in the Kundalini doctrine. I hope you are not pulling my leg. Extrapolating from my comment to Elst’s straw-man debunking is surprising. If Rajesh Rao et al point to likelihood of a linguistic system, we see the zealous aggression of the Sproat, Witzel and Farmer. Their agenda is to shut down counter-arguments. I think that etymology is a good clue to possible past connections.